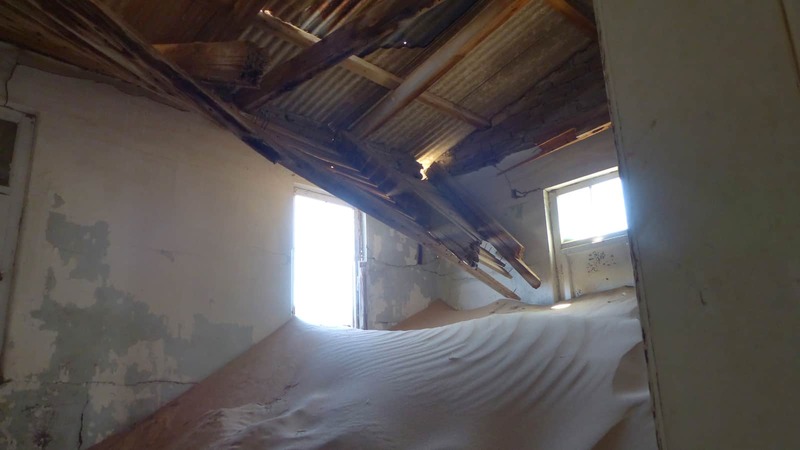 The History of Kolmanskop began with an accident: In 1905, the transport driver Johnny Coleman got stuck with his ox wagon during a sandstorm. Over the years, the stranded wagon obstructed so much sand that a sand dune developed. Three years later, the worker Zacharias Lewala found a diamond while working on the railway from Keetmanshoop to Lüderitz. 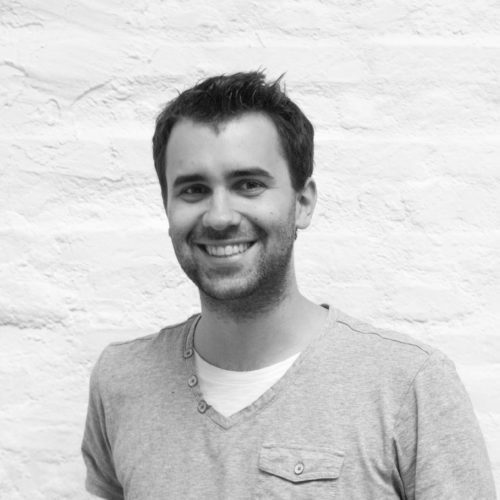 He showed it to his supervisor August Stauch, who quickly realized the economic potential of the finding. The German government declared a large area as “Sperrgebiet” (restricted area), and the diamond rush began. The Sperrgebiet is still in place today, and entering without a permit is strictly forbidden. 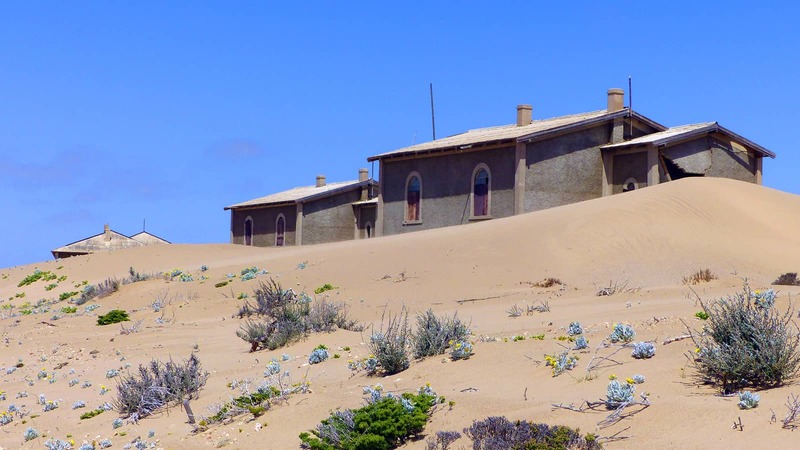 Kolmanskop nearly instantly developed into one of the richest and most modern towns in Africa. Although the population at its prime was just a couple hundred diamond searchers and their families, the town had amenities such as an ice factory, electricity in most of the houses, a modern hospital, a swimming pool, a private school, a ballroom, casino, theatre, a sports hall, and even a tram line (again – keep in mind that just some 400 people were living there)! 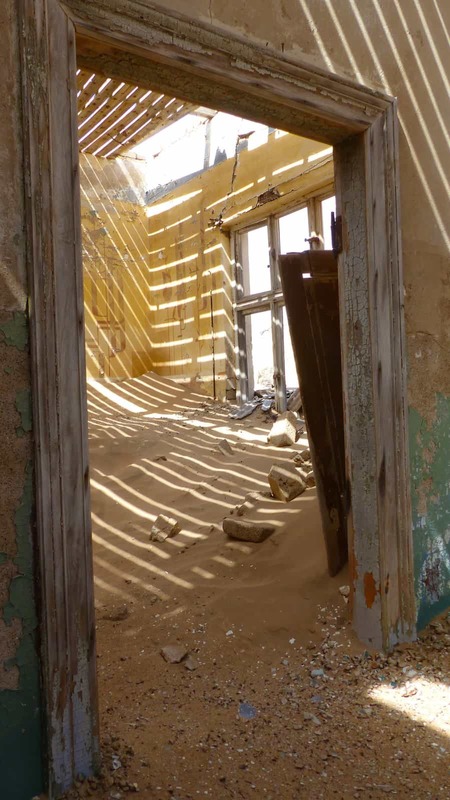 By the early 1920s, the diamond field slowly started to deplete and Kolmanskop started to decline. In the 1930s, most of the population moved south when the diamond field near the Orange River was discovered. The diamonds there were not only up to six times larger, they were literally lying on the beaches and just needed to be picked up (and not mined in the hot desert sand). 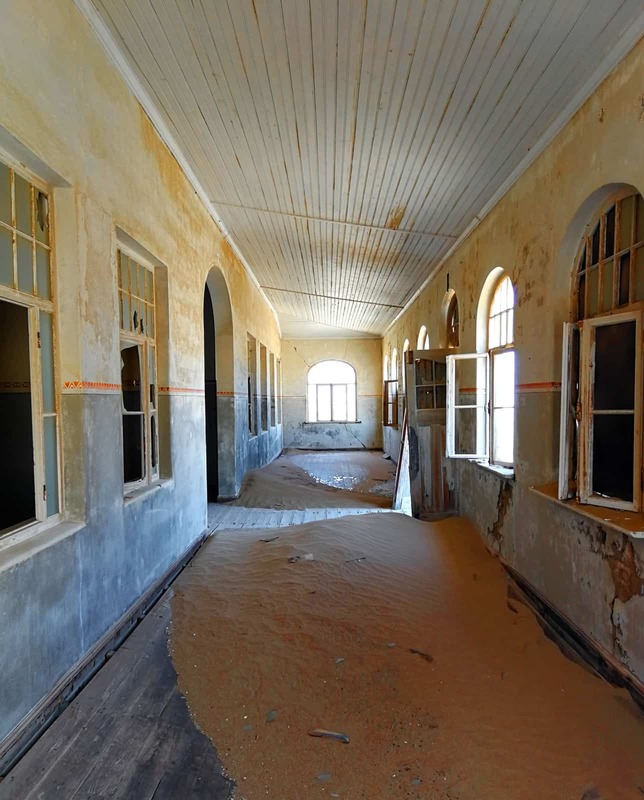 In 1954, Kolmanskop was eventually abandoned for good. 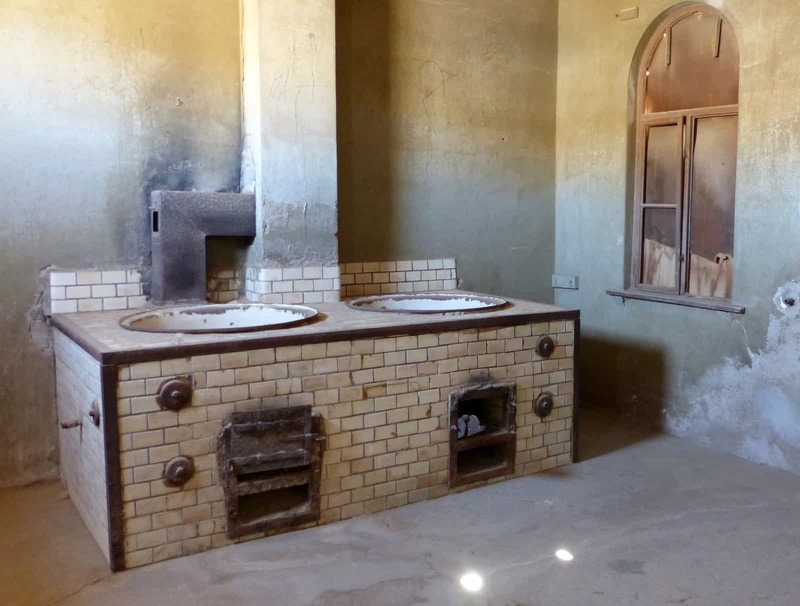 We enjoyed the guided tour of Kolmanskop: It was interesting and educational. 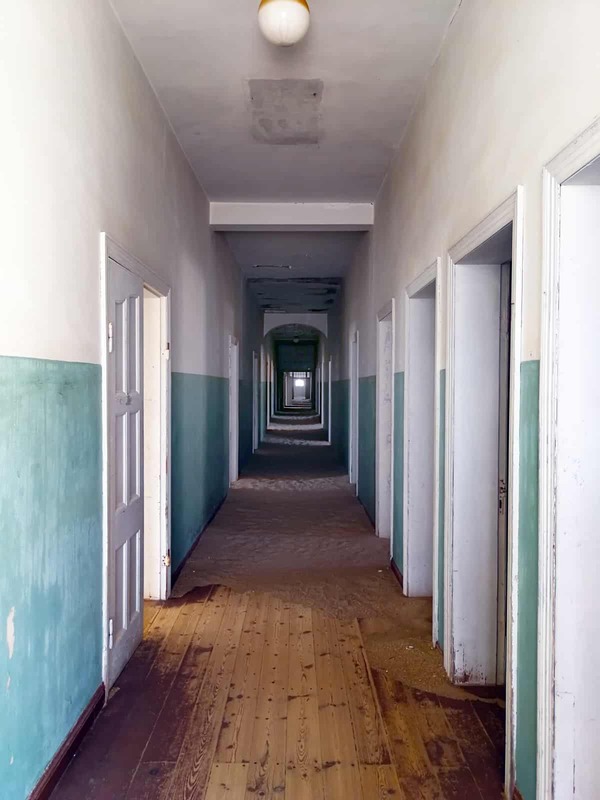 Nowadays, Kolmanskop is a popular tourist destination. Opening hours are limited, and due to it’s location in the Sperrgebiet, it’s required to buy a permit at the entrance. 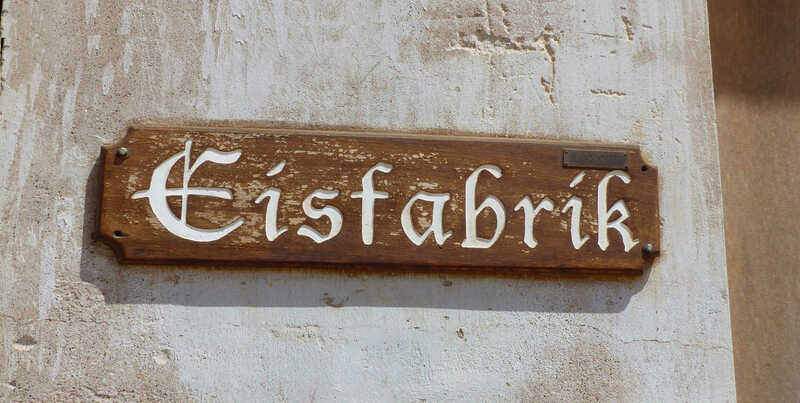 There are guided tours in German and English. 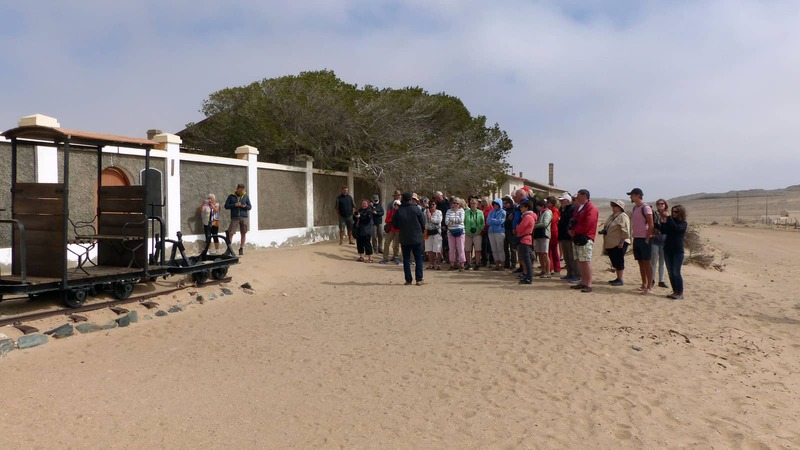 We joined the Sunday 10AM tour (the only tour that day) and found it really interesting and educational, despite the large group size. Our guide told us that he once even had a group with 97 people! The general store, and especially the house of the store keeper, are still in a very good condition and can be visited. An original accounting book bears testimony which luxury items were imported from Germany and all over the world. The store keeper was the richest women in Kolmanskop. 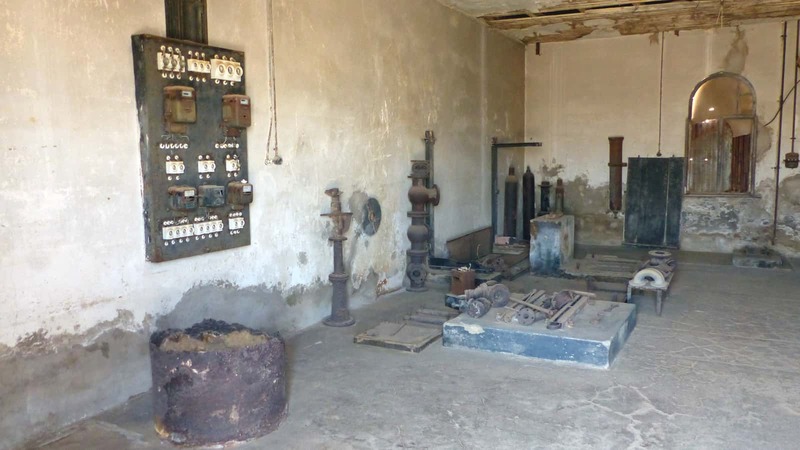 Next to the store, the ice factory and much of the original equipment can be visited. 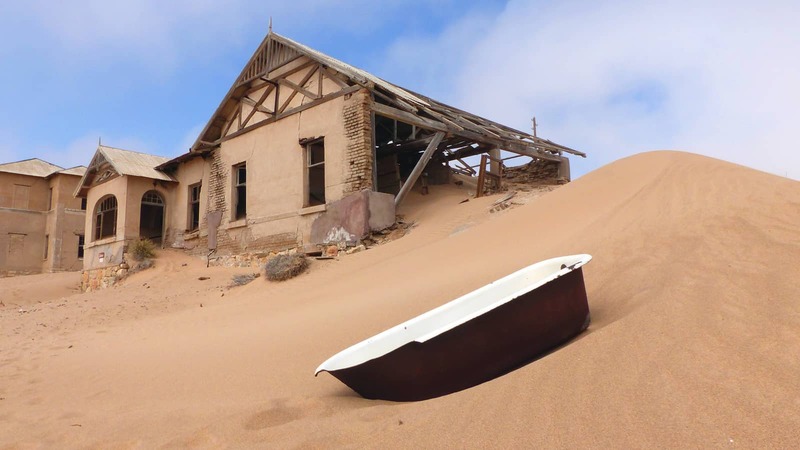 Each citizen of Kolmanskop was allowed to collect one ice block per day to cool their fridge – an absolute luxury for Africa at the beginning of the 20th century. The cold water from the ice factory was recycled to cool down the cooling chamber of the adjacent butcher’s building. A good “German” town had a sausage machine, even in Africa. Even though football is clearly the German’s favorite sports, hardly any other sport is as German as skittle. 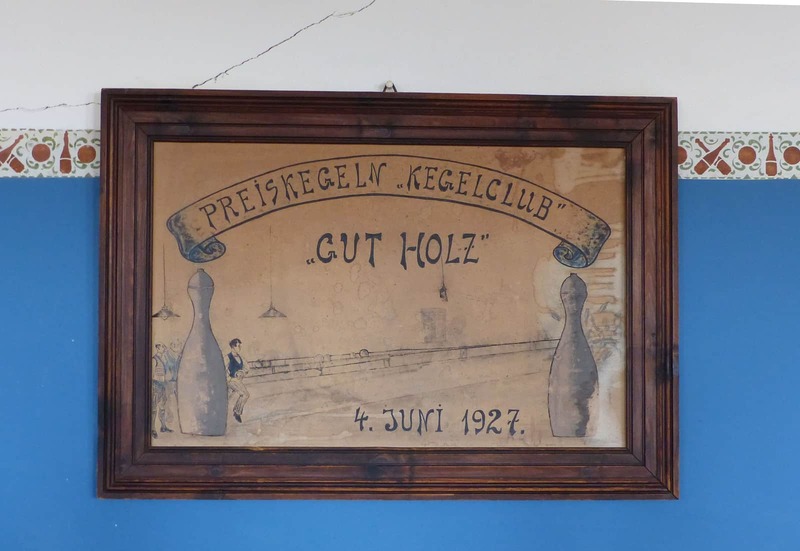 Consequently, Kolmanskop had its own skittle alley, which is still intact today. Skittlers could use one of two lanes. At the end of the lane, a “Kegeljunge” would wait for the ball, re-arrange the pins and send the ball back on a cleverly-designed ramp. Poster for a Skittle Competition from 1927. The skittle alley is still intact. Today, the hospital has an eerie atmosphere. 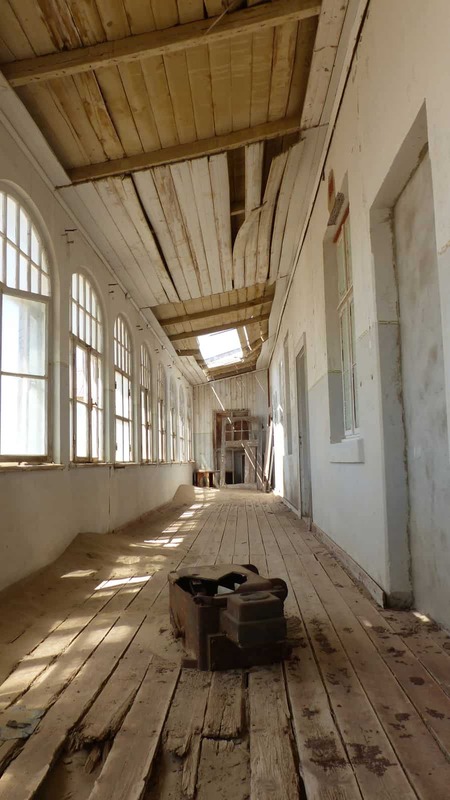 It was one of our favorite buildings in Kolmanskop. No more patients anymore – just dust and snakes. The children of the German workers attended “Kolmanskuppe Privatschule”. Visitors can still see a class photo and some original grade reports in the museum (inside the new casino). 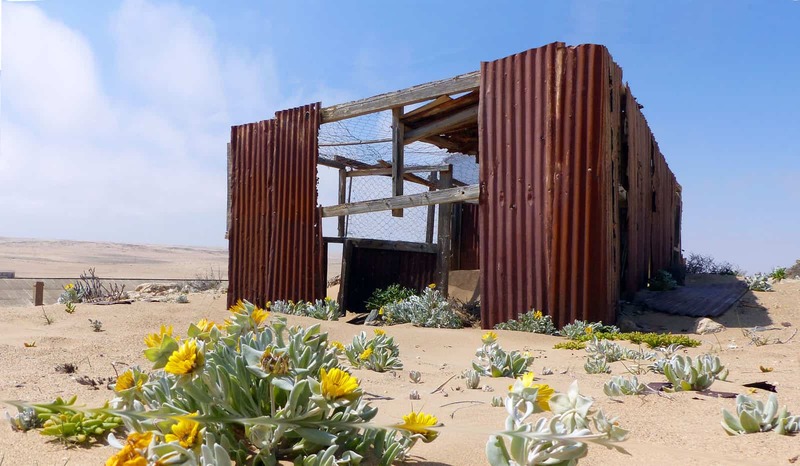 The school is located at the end of Kolmanskop; but the 10-minute walk through the deep desert sand is worth it. Our guide warned us of snakes, and someone wrote “snakes!” on one of the windows, so always be alert! Worker’s accommodation varied significantly in standards. The architect, the teacher, the entertainment manager, and the mine manager lived in beautiful mansions. Married German workers had a small house for themselves, while single German workers lived together in long houses. 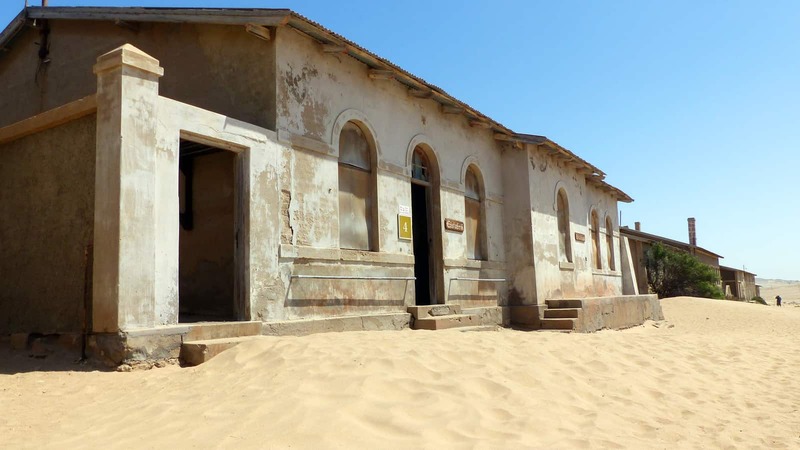 The Namibian workers lived in barracks about 200 meters away from the main village. Nowadays, the wind and the sand are taking their toll on the houses. Sand dunes “eat” the houses one by one, and the sharp sand corns are working on the walls like gravel paper. The Casino was the main hall of the town. It shouldn’t be confused with a gambling hall – in old German, a Kasino was just a place where people met to be entertained. The Casino had a large dining room, a champagne room for the ladies of Kolmanskop, a theatre, a music hall, and a gym (“Turnhalle”). Today, it is also home of a museum which provides interesting background information. Shoes: Relatively straight-forward: Shoes have been tried as a smuggling device already in Kolmanskop-times, and are still in fashion today. Easy to detect though – no honorable security guard would be fooled by such attempts. 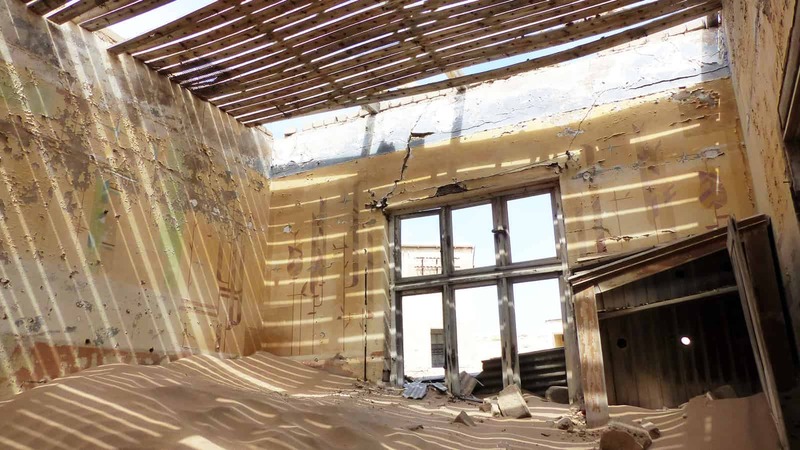 Swallowing: There’s a good reason why Kolmanskop invested in an expensive x-ray machine. Swallowing diamonds is the most obvious way to get diamonds past an external security scan. Even though there’s no chance to get past the x-raj with this, workers still try it today. Fun fact: Before Kolmanskop bought the x-raj, workers had to wait several days in quarantine before they were allowed to leave the town. By this means, the mine operators tried to make sure that any swallowed diamond would have, ehm, left the body before the worker left the area. Keeping carrier pigeons is strictly forbidden in the Sperrgebiet. Nonetheless, many a worker tried to smuggle diamonds with the help of pigeons. Unfortunately, many pigeons could not keep up with the heavy diamond load and went down before they left the Sperrgebiet. The security guards just had to let them recover for a couple of days and then follow them to their destinations to identify the diamond thieves. The notepad: One worker was notoriously known for always carrying his notepad with him. Of course, he also carried it when he left the diamond area. He would let the security guards x-ray it, and passed the control countless times. But one day, one of the security guards noted that the back of the notepad, which was made from lead (i.e. held up the x-rays), was loose and examined it further. There was a cleverly concealed chamber in the back of the notepad, just large enough to smuggle 1-2 diamonds. Even though it was ultimately discovered: Thumbs up for the idea to use lead, and for the nerve to smuggle diamonds every single time to leave the area.